A breeding frenzy of gliding tree frogs! Imagine hundreds of tiny green and yellow masses moving all around on a leaf. They shift up and down, sashaying side to side, stepping on top of one another as they move in different directions. Small, light green buds can be seen around the masses as well. No, these aren’t bugs, but actually an army of gliding tree frogs and their eggs. Each year during the rainy season explosive breeding takes place, leading to these gatherings of frogs. The frogs mate and lay their eggs on long leaves that overhand a body of water. After 6-8 days, the babies, or tadpoles, hatch and fall into the water below, where they will transform and grow into adult frogs. The gliding tree frog is a small species of frog (generally 2-3 inches in length) characterized by its changing appearance. It is light, yellow-green color during the day and a much darker green at night, so as to camouflage itself. They have slim bodies and broad heads adorned with very large red-black eyes with reticulated eyelids (a translucent third eyelid that can be draw across the eye for moisture and protection!). Interestingly, their webbed feet allow them to glide through the air. The webbing acts as a parachute when they jump, which is why they were named the “gliding” tree frog. 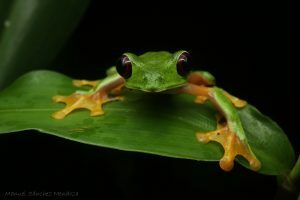 Mostly, the gliding tree frog inhabits tropical and subtropical wetlands (as is necessary for laying eggs) in Colombia, Panama, Ecuador, and of course Costa Rica! They live in the tree canopies of the forests year-round until they come lower to mate by the water sources. 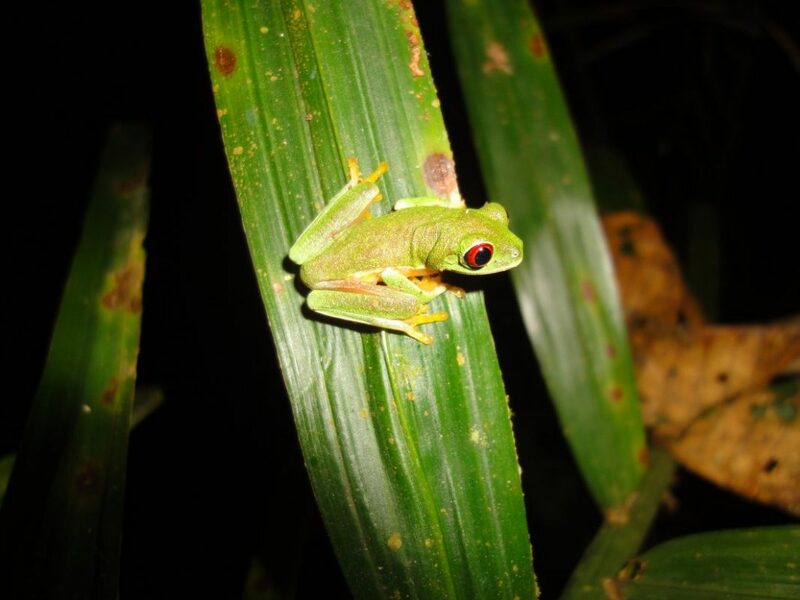 The gliding tree frog hunt mostly bugs such as crickets, flies, and moths. When moving between trees, they use their webbed feet and powerful legs to propel themselves and glide between the branches. Like most amphibious species, habitat loss, pollution, human encroachment and more are threatening them and leading to a trend in decreasing populations. They are still, however, listed as a species of “Least Concern” on the IUCN Red List, as the rate of decrease is slow. Though this is complicated by the frog’s traditional tree habitat, which makes them notoriously difficult to monitor and see. Even so, conservation efforts to protect this species, as well as the countless others threatened by climate change and habitat loss, are essential to protect their futures. Despite being difficult to locate in the trees, the breeding frenzies are another story. Earlier this year, Manuel Sanchez captured an excellent video of one of the breeding frenzies that came along with the beginning of the rainy season in Costa Rica! As you can see, the frogs have no problems with personal space!